December 6 and 7, 2018 marked a new stage in development of Tatarstani-Czech relations, which have been developing for many years and are dynamic and strong. Trade between Tatarstan and the Czech Republic is growing. For the third quarter of 2018 it amounted to 459,6 USD, which exceeded the figure of 2017. At the same time, Tatarstan’s exports to the Czech Republic has reached 417 million USD in oil products, plastic products, rubber, cardboard and paper (296,5 million USD in the same area for the same period in 2017). Czech companies are successfully operating in Tatarstan, a joint working group on coordination of trade and economic cooperation has been established, a dialogue between government and business has been built: over the past year alone, delegations from both sides have made several visits. In addition, the visa center of the Czech Republic was opened, direct air service between Kazan and Prague is operating, Trade and economic representation of Tatarstan is functioning in the Chezh Republic. Tatarstan and the Czech Republic are actively cooperating in the fields of petrochemistry, energy, automotive industry, agriculture and pharmaceuticals. The South Moravian region should be noted of all the Chezh regions, as we are working actively in many areas. Strengthening of business ties within the working visit of the Czech delegation started on December 6 with a meeting of Tatarstan’s top officials with the Minister of Industry and Trade of the Czech Republic Marta Nováková, who arrived in Kazan to participate in the Intergovernmental Russian-Czech Commission on economic, industrial, scientific and technical cooperation. Such visits contribute to the strengthening of mutually beneficial cooperation between the Russian Federation, Tatarstan and the Czech Republic. In addition to members of the Czech Government, the republic is also attended by a business delegation of Czech entrepreneurs who became the participants of the 18th International Specialized Exhibition "Mechanical Engineering. Metalworking. Kazan". Chezh Republic was represented by such companies as Rubena, I.B.C.Praha, MPower. This confirms that Tatarstan and the Czech Republic are ready to implement new joint projects. In the framework of the Czech-Tatarstani business forum, which was held today, December 7, it was decided to continue mutually beneficial cooperation and give it a new impetus. 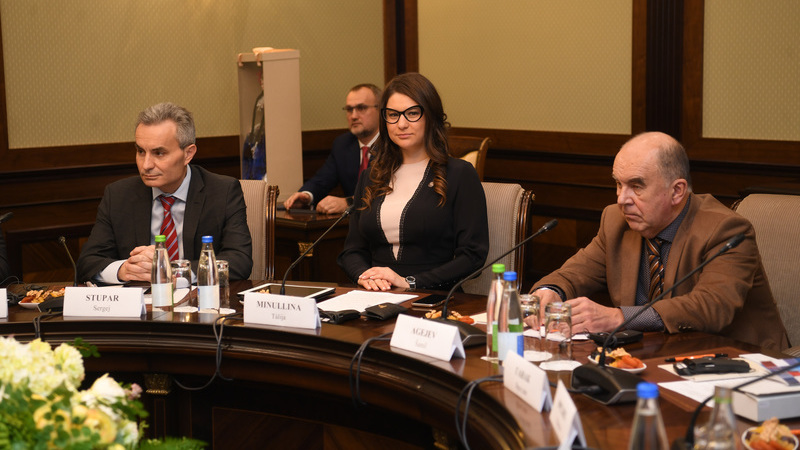 The Head of Tatarstan Investment Development Agency Taliya Minullina told Czech businessmen about Tatarstan and presented the investment potential of the Republic. "Tatarstan has all the conditions for comfortable and profitable work of Czech business. At the same time, investments in the Republic have significant advantages. Surely, you can create production and open businesses in Moscow, but it is very expensive. Labor, land, rental of premises and everything related to doing business are cheaper in the region, and therefore working here is more profitable. We invite Czech entrepreneurs to become residents of Tatarstan investment sites", - Taliya Minullina stated. Tatarstan pays special attention to innovative development - creation of nano-and biotechnologies, production of composite materials and other directions. "The most valuable thing at the forum is not official statements, but the search for solutions for joint business. One of the important areas for cooperation that we are considering is high technologies. We appreciate the existing relations with Tatarstan, despite the foreign policy situation, and the fact we can continue to strengthen them. Interaction of Tatarstan with our industrial South Moravian region is a model of cooperation that should be supported", - Marta Nováková shared.